Supplied: In three litre containers of peat free compost, healthy and well established, approximately 60-90cm (2-3 feet) high, with full planting and aftercare instructions. For the rate of growth, ease of culture, and stunning beauty, one is not going to find many large conifers that are as nice as a Deodar cedar, or Cedrus deodara. During the Christmas season, Deodar cedars are frequently sold in pots for live Christmas trees, which is no surprise. Deodar cedar makes a beautiful tree - Christmas or otherwise - owing to its handsome silhouette, graceful form, and beautiful, cool blue-green foliage, all traits that also make it a superb choice for the landscape, that is, if there is room on the property. Deodars eventually reach 15-20 meters high with a wide spreading form. Few trees acquire such elegance in old age or lend such an air of distinction to a property as a mature Cedar. 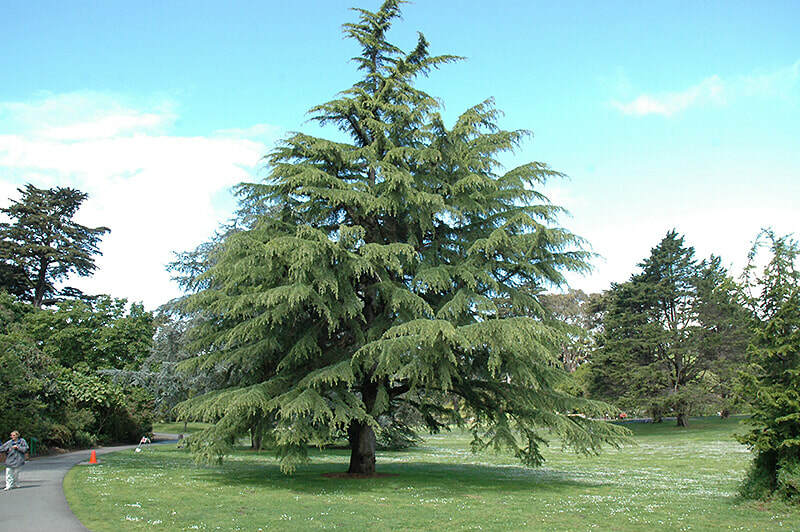 The Deodar cedar is also known as the Himalayan cedar since it is native to those regions and is perfectly suited equally to our climate throughout the UK and Ireland. It is as trouble-free as it is beautiful with little pest or disease issues, and also does well on a wide range of soils bar poorly drained constantly damp ground.